"This recipe is from my mom. Makes a very crusty bread. You can substitute half of the flour amount with whole wheat flour." In a large bowl dissolve the yeast in the warm water or potato water. Add sugar and salt and mix well. Stir in 7 cups of the flour. On a well-floured surface, knead dough for 7 minutes, incorporating in the last cup of flour. Place dough in a greased bowl. Let rise until doubled. Using a lightly floured board, form dough into 2 long or round loaves. Sprinkle cornmeal on greased baking sheet; place loaves on top. Slash top with a sharp knife. Cover, and let rise until almost doubled. Brush top of loaves with cold water. Sprinkle with sesame seeds, if desired. Place in a cold oven. Turn oven to 400 degrees F (200 degrees C). Bake for 45 minutes, or until nicely browned. Brush twice during baking time with cold water. I've been looking for just such a recipe for a long time! My husband grew up in a Cuban family and always praised the bread they served. 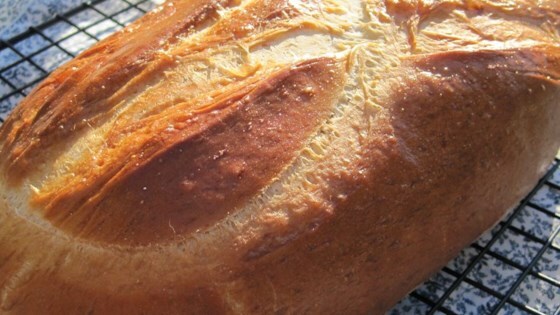 I have made this bread a number of times and we always love it. The recipe is very simple but the result is wonderful.